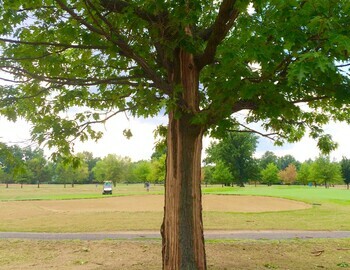 A tree at Briardale Greens near the #3 tee box was recently struck by lightning during a thunderstorm that came through the area. As you can see in the photo, the tree bark was blown off the tree in multiple areas as a result of the lightning strike. A single lightning bolt can generate a temperature of about 54,000 degrees or 6 times the surface of the sun. Avoid – Solitary trees, Small rain and sun shelters, Large open areas, Wet areas, Elevated areas, All metal objects including; Golf Clubs, Golf Cars, Fences, Electrical and Maintenance Machinery, and Powerlines. Seek – Large Permanent Buildings, Fully enclosed Metal Vehicles, Dense are of Trees and Bushes, and Lowest Elevation Area.